Me too! Uh, all in the interest of breast cancer detection and awareness, of course. Wait, what did you think I meant? As is often the case, this topic interests me more than it appears to engage Ethics Alarms readers, so I was thrilled to see the following comment by Ulrike, who seems to share my belief that “Keep A Breast” Foundation is the ethics villain of this First Amendment skirmish, choosing buzz and cheap publicity over responsible messaging and being willing to throw well-aimed, legally immune monkey wrench into the classroom as well. Here is the Comment of the Day by Ulrike (who also has amassed a bumper crop of Ethics Alarms brownie points by being the blogs most determined volunteer proof-reader) on the post The “I ♥ Boobies” Saga. 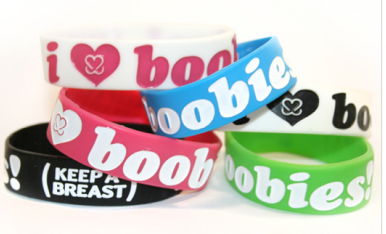 Some time in the foreseeable future, we may have the pleasure of reading the various opinions of sages like Antonin Scalia and Ruth Bader Ginsberg regarding the import of bracelets bearing the message, ” I ♥ Boobies,” and whether it is a constitutional violation for public schools to ban students from wearing them. In August, the Third Circuit U.S. Court of Appeals rejected Pennsylvania’s’ Easton Area School District’s prohibition of the breast cancer awareness bracelets on the grounds that they were potentially disruptive and inappropriately vulgar. In late October, the District voted authorize the district’s solicitor to file a petition with the U.S. Supreme Court seeking to have the high court hear arguments in the case. The controversy has been going on for three years, has cost the district thousands of dollars in litigation costs that should have been spent on education, and will result, you can bet, in even more egregious expansion of vulgar language in the schools.